The White House said it sanctioned Venezuela's oil industry, which could worsen the country's ongoing economic crisis. The White House has leveled another round of sanctions on Venezuela — this time going after its oil industry. The order accuses Venezuelan President Nicolás Maduro of undermining the country's democracy and "prohibits dealings in new debt and equity issued by the government of Venezuela and its state oil company." "These measures will also undermine Maduro's ability to pay off political cronies and regime supporters and increase pressure on the regime to abandon its disastrous path," Treasury Secretary Steven Mnuchin said at a White House press briefing. This is a big step because Venezuela's economy is largely based on its oil industry. This doesn't fully block the oil trade between the U.S. and Venezuela, but it does make it tougher for the Venezuelan government to access the U.S. financial system. The order will likely make it harder for Venezuela to help fix its economy. The Trump administration hopes the hardships could force a political change. 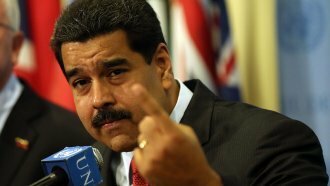 The sanctions were announced after Maduro and his supporters created a new constituent assembly in an election many international observers said was fraudulent. Even though Venezuela is losing access to lots of U.S. money, it still has economic allies. Maduro is leaning on China and Russia to keep the country economically afloat.